Magical Uses and History: From Central Africa to the Far East, the fig tree is often referred to as the Tree of Life and Knowledge. The Greeks believed the fig was a gift from Demeter and sacred to Dionysus. For this reason, figs were revered as objects of fertility and love. The term sycophant, which dates back to ancient Greek fig trade, literally translates into "one who shows fig." It originally referred to one who informed on fig smugglers. Men and women wishing to conceive can carry fig wood carved with phallic images to boost fertility. Eating fresh figs will yield the same result. You can also use fresh figs to charm any man or woman. They will be spellbound by your presence if they consume the fruit. 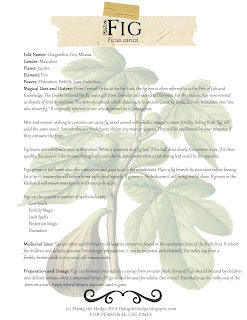 Fig leaves are sometimes used in divination. Write a question on a fig leaf. If the leaf dries slowly, the answer is yes. If it dries quickly, the answer is no. A slow drying leaf could also be good omen while a fast drying leaf could be the opposite. Figs grown in the home also offer protection and good luck to the inhabitants. Place a fig branch by your door before leaving for a tip to ensure you will return home safely and happily. If grown in the bedroom it will bring restful sleep. If grown in the kitchen it will ensure your family will never go hungry. Medicinal Uses: Figs are often used for their mild laxative properties found in the saccharine juice of the fresh fruit. It is best for children and delicate persons. For stronger preparation, it can be prepared with rhubarb. The milky sap from a freshly-broken stalk is very acrid will remove warts. Preparation and Dosage: Figs can be taken internally in a syrup form or eaten fresh. Syrup of Figs should be used by children and delicate persons while Compound Syrup of Figs should be used for adults (see recipe). Externally use the milky sap of the stem on a wart. Apply several times a day until wart is gone.